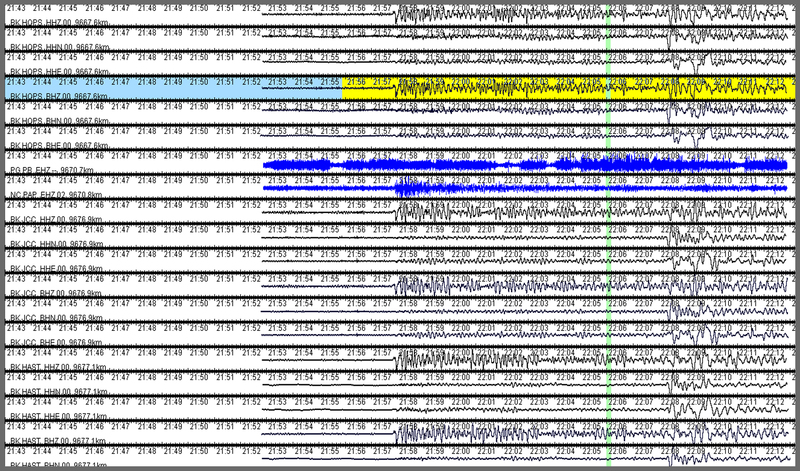 The energy shown here is from a large magnitude earthquake located outside the SCSN boundaries. It is common for our network to detect these large earthquakes that start commonly around the borders of the Pacific Ocean. The distinguishing features are long-period waves that tend to almost uniformly hit our entire network around the same time. Below is a recording of our live stream depicting a teleseismic event that occurred on 2017/02/24 at 17:28:43 UTC Near NUKU’ALOFA, Tonga. Note that all of the waveforms enter the window at almost exactly the same time, and have a very long coda lasting multiple minutes, instead of mere seconds as is typical of local events. In addition to displaying where the wavefront of an earthquakes is, this video is a nice representation of how large earthquakes, if large enough, can be detected by seismic equipment around the world, registering in our network as a teleseism.